Puggles Swim School®: Pregnant? Feeling heavy? Aquanatal yoga to the rescue! Pregnant? Feeling heavy? Aquanatal yoga to the rescue! When you're pregnant there are few things better than being able to take a load off and get some rest and relaxation. How long has it been since you slept on your stomach? 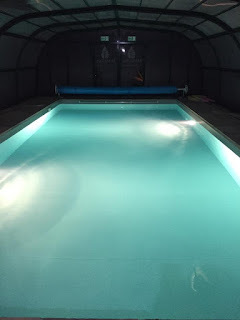 So why not treat yourself and spend an hour in this gorgeous, warm pool, heated to 34 degrees, a constant depth of 1.2m throughout. Relax and unwind in this small corner of paradise, enjoying all the benefits of aquanatal yoga from a qualified instructor. Aquanatal yoga is such a wonderful, effective and gentle form of exercise for pregnant women, no matter what your level of fitness might be. Just being in the warm soothing water provides you with an easy way to achieve deep relaxation, while at the same time encouraging you to experience positive feelings. Aquanatal yoga is a fantastic experience, allowing you to exercise while being supported by the water and to improve your overall well-being to help you return to your full fitness following your baby's arrival. Aquanatal yoga is a safe workout where you can be with other mums-to-be enjoying this precious bonding time with your bumps!